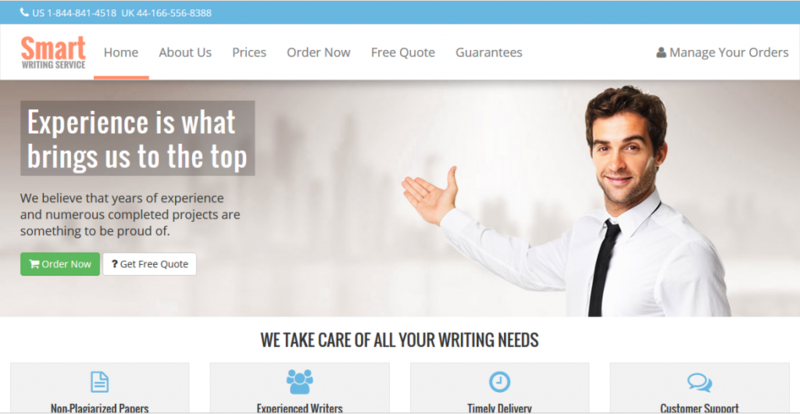 Smartwritingservice.com is another content writing company that differs from others mostly based on their highly competitive prices. As well as the other valid custom writing services, this one too offers a variety of content writing. Based on some reviews we found online, this company is both valid and provides quality content. This content provider offers various types of academic papers, including dissertations, thesis, case studies, essays, lab report etc. The website is well-designed and easy to navigate, so you should not have any issues finding the information on the paper you want to order. One disadvantage of this service is that they do not offer proofreading and editing services like many other companies do. So, the only thing they can provide you with is written content from scratch. The deadlines range from 1 month to 8 hours, but the longest deadline is only available if your order is longer than 30 pages. Additionally, the shortest deadline of 8 hours is not available for Ph.D content, which is quite understandable because such content requires more attention and research. Most of the comments from customers are positive in term of content quality. The biggest accent on this company is set on the competitive price, but after you have a closer look, you will realize that this is not so true. Sure, the range of $10 to $45 for page is a good price, but still qualifies in the average cost for orders. The one thing they have different from other sites is that they offer a longer deadline for your content. You can actually order content one month before the deadline. The price of the order depends on the academic level, urgency, type of paper and number of pages. There is a price calculator on the website, but this calculator does not provide clients with the final quote, which makes it a bit useless. If you wish to see how much your paper is going to cost exactly, you have to complete the order form. The payment is a big disadvantage with this content writing service. The prices are enlisted in US dollars, so if you wish to pay in Australian dollars, you may lose money after the conversion. You can pay with PayPal and credit cards. Smartwritingservice.com does not offer first order discount. However, they have a 5% lifetime discount if you spend $500 at their website, 10% for $1000 and 15$ for $2000. They also offer free features like title page, formatting, bibliography and revisions. It is a smart writing service because they charge a great deal of money for horrible papers. Do not make the same mistake. Pick another service!